Can you give too much of yourself chasing bigger audience figures? It’s got to be memorable and engaging. That’s a given. Targetted to your particular audience. Tick. Something different that we’ve not heard before? Certainly helps. Let’s go live to St Louis and local radio station 106.5 The Arch to witness a birth on air… by one of the presenters! 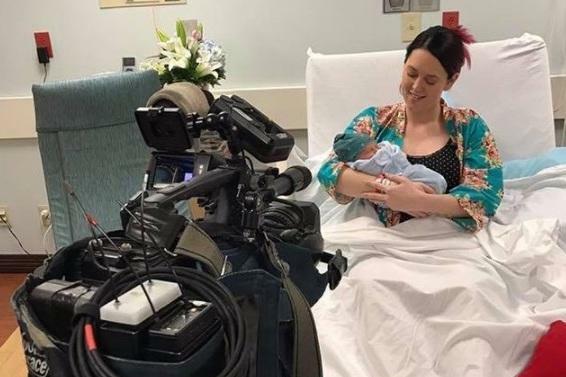 Yes, you heard right, last week one of The Arch’s DJs – Cassiday Proctor – gave birth to a healthy 7lb6oz son live on air from their local hospital during a pre-planned segment of her show in what she described as a “spur of the moment broadcast opportunity”. I’m all one for pushing the boundaries… but this is one push too far for me. I’ve listened to the actual broadcast and the intention to create a ‘wow’ moment, in reality, is more of a ‘meh’ moment. We hear Cassiday’s co-host Spencer Graves commentating from the studio over the top of some chit-chat between Cassiday and her husband. Then there’s the sound of medical professionals at work in the background and then the announcement “he’s out”, followed by a little baby cry and then let’s go back to the studio for the weather! Afterwards, Graves described it as: “a magical, intimate moment” but that’s exactly what it wasn’t in my eyes. Having visited the labour ward twice with my wife for the delivery of our 2 sons, I think there’s something special lost by sharing this most personal of moments with a MASS audience of mostly strangers. Cassiday’s given too much of her personal life over to her work. As if that wasn’t enough, during her pregnancy she gave listeners the opportunity to NAME her baby, choosing between 12 ‘silly’ names and 12 serious ones selected by her and her husband. The name with the highest amount of listener’s votes would be victorious – thankfully ‘Jameson’ prevailed over Blitzkrieg, Anakin or Stan The Man! Cassiday Proctor has certainly got a LOT of publicity out of this for her show and herself. And I’m sure the audience figures would’ve sky-rocketed. I wish her, Jameson and their family the very best but I’m still sticking with my favourite station talkSPORT– where, instead of hearing wailing newborns, I can hear grown men calling the phone-ins and crying like babies when their teams lose!